On a visit to New Jersey a week ago, I took a short visit with a friend to New Hope, PA on the Delaware River just north of Philadelphia. New Hope is a very artsy and historic little town, very close to Washington’s Crossing Park. While there I occasionally heard the steam whistle of a train and after a short walk found the station of the New Hope and Ivyland Railroad. Just as we arrived at the station a steam engine was backing up to couple up to a group of vintage passenger cars. I chuckled to myself because in Cleveland just a few weeks ago, many of my friends spent a day chasing a steam engine that was passing through the area and battling crowds of anxious fans and photographers to get some great photos! Here I was, coming across a steam engine that runs daily and giving me photo ops without the mobs of people to try to eliminate from my images! As Engine #40, restored to service in 1991, prepared to leave the station on one of it’s many daily excursions into the Bucks County, PA countryside, I scurried to the opposite side of the track to get some unobstructed photos. The two shots posted here are taken as the train passed by within just a few feet of me. Close enough that I felt the steam on my shoes and pant legs as it passed by! I felt extremely fortunate to have just come across this great shooting opportunity! I converted the original color images to black and white for a more vintage look. I really prefer black and white photography but in this age of digital photography, don’t often think of or specifically shoot for the black and white look. The next time I get back to New Jersey, I’ll probably make an effort to get back to New Hope, PA for more of these shots and perhaps even a ride on the New Hope and Ivyland! 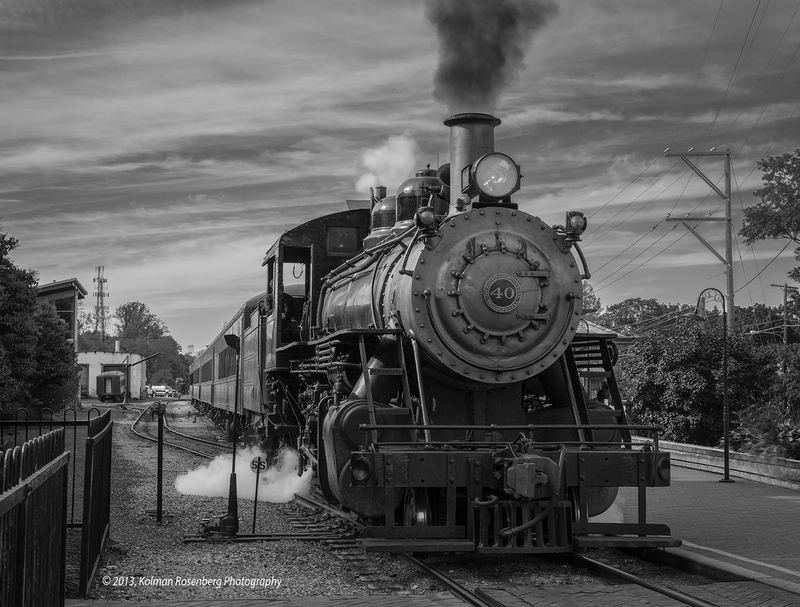 This entry was posted in Uncategorized and tagged #40, B&W, Black and White, Engine, engine #40, locomotive, monochrome, New Hope, New Hope and Ivyland, new jersey, nj, pa, photography, rail fanning, railroad, station, Steam, Train, washington's crossing. Bookmark the permalink. Some terrific photos Kolman! Great detail!! Fun, fun, fun and great photos. Thanks Lin, it was a fun place to shoot! Yep it sure wasn’t it? Two fantastic photographs…The black & white version is exactly right for this type of photograph. I know what you mean about trying to take photographs with a crowd of people around. It makes things a lot more difficult. That is if you don’t want to photograph people also :~) Thank your for your post and sharing. Wow Kolman! 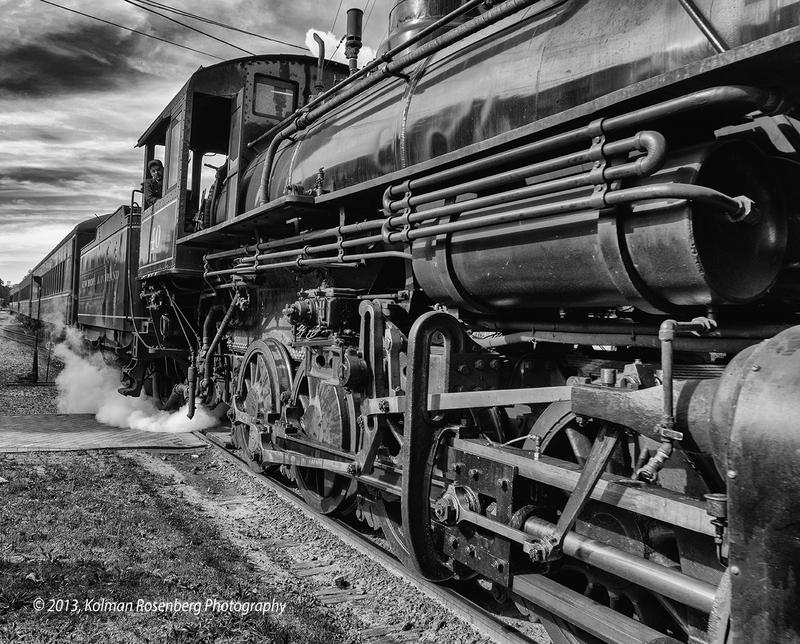 Such an amazing opportunity to shoot this steam engine, and how you happened to stumble across it. Your photos are Stunning. Fantastic Job. Thanks for the comment Erik!